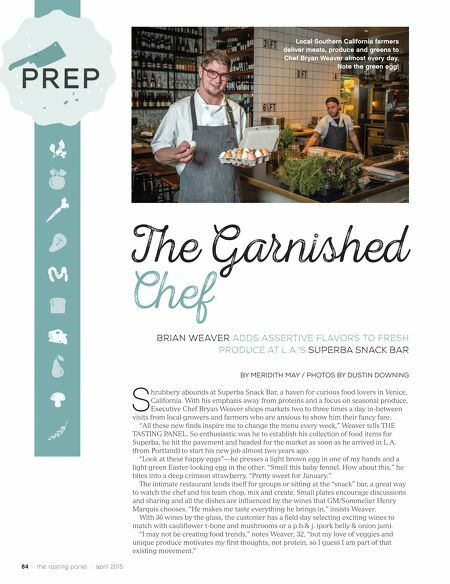 84 / the tasting panel / april 2015 K N O R T W X B I L BRIAN WEAVER ADDS ASSERTIVE FLAVORS TO FRESH PRODUCE AT L.A.'S SUPERBA SNACK BAR by Meridith May / photos by Dustin Downing S hrubbery abounds at Superba Snack Bar, a haven for curious food lovers in Venice, California. With his emphasis away from proteins and a focus on seasonal produce, Executive Chef Bryan Weaver shops markets two to three times a day in-between visits from local growers and farmers who are anxious to show him their fancy fare. "All these new finds inspire me to change the menu every week," Weaver tells THE TASTING PANEL. 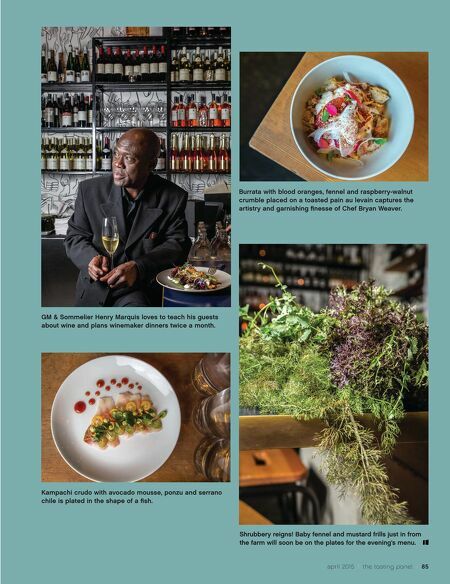 So enthusiastic was he to establish his collection of food items for Superba, he hit the pavement and headed for the market as soon as he arrived in L.A. (from Portland) to start his new job almost two years ago. "Look at these happy eggs"—he presses a light brown egg in one of my hands and a light green Easter-looking egg in the other. "Smell this baby fennel. How about this," he bites into a deep crimson strawberry. "Pretty sweet for January." The intimate restaurant lends itself for groups or sitting at the "snack" bar, a great way to watch the chef and his team chop, mix and create. Small plates encourage discussions and sharing and all the dishes are influenced by the wines that GM/Sommelier Henry Marquis chooses. "He makes me taste everything he brings in," insists Weaver. With 36 wines by the glass, the customer has a field day selecting exciting wines to match with cauliflower t-bone and mushrooms or a p.b.& j. (pork belly & onion jam). "I may not be creating food trends," notes Weaver, 32, "but my love of veggies and unique produce motivates my first thoughts, not protein, so I guess I am part of that existing movement." e Garnished Chef Local Southern California farmers deliver meats, produce and greens to Chef Bryan Weaver almost every day. Note the green egg!